For you see the price online, Only select the requirements that you seek. Type of Door: The doors for your cold rooms can be, hinged or sliding door, select the type and dimensions for its. 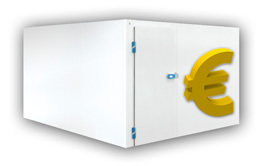 Easier for us to give their estimate of costs, we have available, this tool so that you know online, the price of cold rooms (walk ins) that you need to purchase, there is one thing you should know, the cold rooms (walk ins) that sell here, are new, but our prices, are second hand. The cold rooms (walk in cooler 0ºc), the panel can be configured with 60, 80 and 100mm of thickness. And the freezer rooms, (walk in freezers 20ºc) for default, the supply with insulation panel of 100mm thickness.